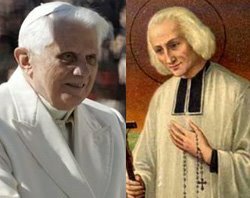 The good news is all over the blogosphere: His Holiness Pope Benedict XVI announced yesterday a jubilee year for priests that will start on June 19, 2009 and culminate on June 19, 2010. It will commemorate the 150th anniversary of St. John Vianney, Cure of Ars, the patron saint of parish priests. “God is the only wealth that, definitively, mankind wishes to find in a priest,” said the Holy Father. Benedict XVI stressed the need to “have care for the formation of candidates to the priesthood“, a formation that must maintain “communion with unbroken ecclesial Tradition, without pausing or being tempted by discontinuity. In this context, it is important to encourage priests, especially the young generations, to a correct reading of the texts of Vatican Council II, interpreted in the light of all the Church’s doctrinal inheritance”. “The centrality of Christ leads to a correct valuation of priestly ministry, without which there would be no Eucharist, no mission, not even the Church. It is necessary then, to ensure that ‘new structures’ or pastoral organisations are not planned for a time in which it will be possible to ‘do without’ ordained ministry, on the basis of an erroneous interpretation of the promotion of the laity, because this would lay the foundations for a further dilution in priestly ministry, and any supposed ‘solutions’ would, in fact, dramatically coincide with the real causes of the problems currently affecting the ministry”. Let us start praying now for our priests, through the intercession of St. John Vianney. Some of you may remember the prayer for priests I posted a while ago. We have a great Pope!! View the Vatican’s press release here. View the Zenit article on this topic here. This entry was posted in Catholic News, Pope Benedict, Prayer, Priesthood. Bookmark the permalink. I think it's a neat coincidence that the year you're entering into the seminary the Pope declares it a year for priests. Kinda cool, Mike. Blessed Mother Mary, pray for them. Teresa: Got that right. Clearly our Holy Father is very interested in betting the formation of seminarians. Love the “Year of the Priest”! It's about the priests get some positive affirmation!